Outside of the walls of Indium Corporation few people likely hear the word “gallium” spoken very often. Yet, in one important way, gallium is fundamental to modern living: lighting. From the mists of time in prehistory until about the 1900s people lived in the dark. Lighting is probably the one aspect of modern living that we take most for granted. This fact was brought home to me when I watched the movie The Man Who Invented Christmas. This movie is a tale about Charles Dickens' writing of A Christmas Carol. In a side plot of this movie, Dickens is helping one of his relatives who is writing his own novel. The relative complains that Dickens is not giving him enough candles. It was hard to be a writer in 1840s London without adequate candles, especially in the winter as daylight is so short. Any form of lighting before 1900 was extremely expensive, a gallon of whale oil was about $250 in today’s currency. Edison’s development of practical incandescent lighting in 1880 was a tremendous breakthrough which also promoted the development of an electric power grid. By the early 1900s, electric lighting was becoming common and relatively inexpensive; however, only about 3 to 5% of the energy consumed by an incandescent light produces light, the remainder of the energy is wasted as heat. Fluorescent lighting is much more efficient, but the real efficiency champion is LED lighting. To get the amount of light from a 40 watt incandescent light, a compact fluorescent (CFL) needs only 11 watts and an LED only 7 watts. A CFL lasts about 7 times longer than an incandescent at 1200 hours, but again the LED is the champ at more than 25,000 hours. In most cases, this is literally a lifetime. Neither the CFL nor early LEDs had a pleasing color rendering, both having a harsh bright bluish hue; however, recent advances in LED technology has enabled bulbs with as pleasing a color rendering as an incandescent bulb. See Figure 1 for a comparison of the attributes of these different types of lighting. Figure 1. An LED is the most efficient, long lasting, and cost effective of all lighting sources. Lighting consumes about 7% of all electricity consumed in the USA. 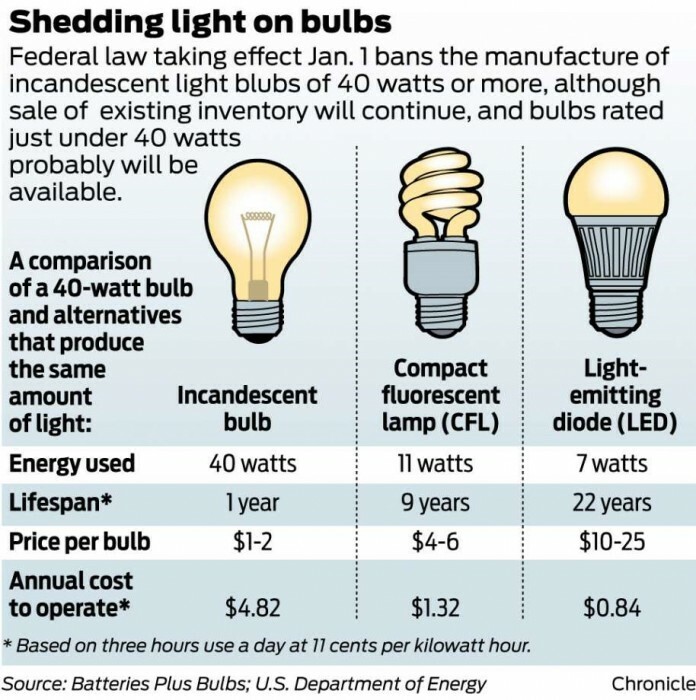 So as LEDs become more common, this 7% should be reduced to 3% or less. The initial cost of LEDs is still quite high; however, taking into account their long life and high energy efficiency, overall they are the cheapest form of lighting. Considering all of these advantages, the light bulb of today and into the future is the LED. Where does gallium fit into this success story? The fundamental material for LED light bulbs is gallium nitride. Figure 2. Gallium is a starting material for gallium nitride used in LEDs. Gallium nitride and its use in LEDs is a relatively recent development that started in the 1960s. When gallium bonds with other elements from Group V of the periodic table (such as nitrogen or arsenic), a semiconductor is formed. Gallium arsenide LEDs came first in the 1960s and was followed by gallium nitride (GaN) in the 1990s. 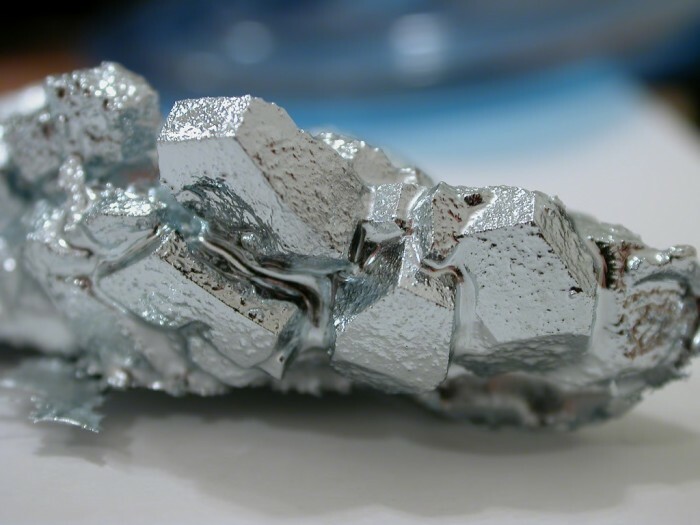 Pure gallium metal has a surprisingly low melting point - it will melt barely above room temperture at about 86ºF (29ºC). If you hold it in your hand, it melts! In GaN, the melting point goes up considerable (to over 4,500ºF or 2,500ºC). It is the semiconducting properties of GaN, especially its bandgap, that make it such an attractive material for building light-emitting devices. So, the next time you turn on a lamp with an LED bulb, remember that, without gallium or more specifically gallium nitride, it wouldn’t exist.